Question: I am working as Asst. Officer (IE) in ABC Fashion Ltd. I just want to know the application of IE in finishing department? I mean what we can do as IE in finishing department? It will be very helpful if you reply me back. Thanks …asked by Hasan. You are an Industrial Engineer. You already know about industrial engineering tools and techniques used for managing and improving production. Most IEs practice IE concepts only in sewing floor. Similar tools can be applied in finishing section also. In the following, I have listed down few things that can be done in finishing department without further brainstorming and skill upgrading. Setting of Standard Time (SAM) for finishing jobs (activities)- Like sewing operations, estimate SAM for finishing jobs. Use Time Study method or synthetic data (PMTS) for determining SAM of a task. Prepare operation sheet for finishing section also. By setting SAM of finishing job, you can plan finishing production accurately; you can estimate finishing cost and manpower requirement. Study existing finishing room workstations layout - Observe if there is scope of improvement for workstation layout. You can apply theory motion economy for re-designing workstation layout. Suggest a better material handling method to finishing room workers - There is always some scope for betterment. Work on method improvement - Observe all finishing tasks. Like garment ironing, spot removing, garment checking, thread cutting, folding and packing activities. Study the method of working different activities. If worker don’t follow same methods doing the same task, you can standardize working method for finishing room activities by applying the theory of Method Study. Spend time on improving a method. By improving method of executing a task, you can reduce cycle time of a task. Maintain WIP in between two workstations – capture finishing production data and calculate WIP. You can work on leveling of workload in each process. Train checkers and other workers – increase skills of workers by training on their task. Other things you can start like, making hourly production report, capacity study, efficiency and labor productivity analysis for finishing department. Start with one activity. Once you are involved in working in finishing section, you will find many ideas to improve finishing room productivity by applying industrial engineering techniques. Finishing department in a garment factory plays an important role. So, standardization of finishing tasks is equally important as sewing operations. 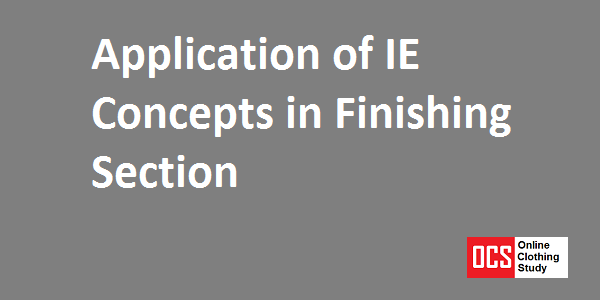 IE concepts are rarely practiced in finishing section as of now. But improvement can be brought out by applying IE concepts.